We’ve reached the All Star break, meaning we’ve hit the “halfway” point of the season. At this point, we can typically take a step back and get a good look at baseball thus far this season and maybe get a good prediction of how it’s going to end. Of course, anything can happen between now and October, and I am neither an expert nor am I clairvoyant. 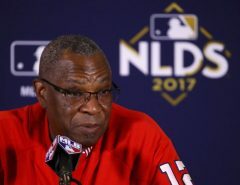 But I’m going to give a go at predicting some of the likely candidates to win the National League MVP at the end of the season. Last August I did the exact same thing (albeit with a month and a half more playing time to consider), and I correctly predicted the top five MVP finalists. So here is my early insight into potential 2017 MVP candidates. As a Nationals fan, it takes a lot for me to admit that the first name that came to my mind when thinking of this list was not a National, but Nolan Arenado. Nolan Arenado is an absolute stud. 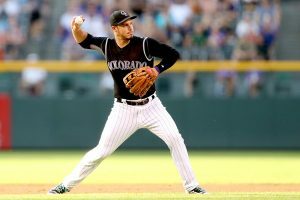 A surprising Colorado Rockies team has taken the league by storm, and they’re led by their star third baseman. Arenado is a one of a kind player — one of the best in the game on both sides of the ball. Every time a Nationals announcer makes a comment about how Anthony Rendon is the best third baseman in the National League, I want so badly to agree, but I can’t because of Arenado. Arenado may not have the best numbers in the league, though they’re still pretty good. He has a .301 batting average, 17 home runs, 70 RBI (T-1st in the NL), 56 runs scored, .351 OBP, .554 slugging percentage, .905 OPS, 106 hits (5th in the NL), and 28 doubles (2nd in the NL). He also sports a WAR of 2.9, which ranks 17th in the majors. But all you have to do is watch him for one game to see just how good he is. He’s a four-time Gold Glover, and seemingly every game he makes a play that you’d think would be impossible. And the man is clutch. Earlier this year, Arenado hit a walk-off, 3-run home run to complete the cycle. And if that doesn’t say just about everything you need to know, I don’t know what does. Arenado finished 5th in last year’s MVP voting, and I believe this year there’s a good chance for him to finish a lot higher than that. I dare say that Daniel Murphy is having an even better year this season than the year he came in second in MVP voting. Through the same number of games played last season (80), Murphy had a .348 batting average, .388 OBP, .581 slugging percentage, and a .969 OPS. This season, Murphy has a .342 batting average (1st in the NL), 14 home runs, 64 RBI (8th in the NL), 57 runs scored (T-8th in the NL), a .393 OBP (10th in the NL), .572 slugging percentage (T-7th in the NL), .966 OPS (5th in the NL), 111 hits (3rd in the NL), and 29 doubles (1st in the NL). At this rate, Murphy is on pace to crack some of his numbers from last season, which is a feat by itself. Let’s not forget Murphy’s consistency, his clutch hitting, and the multiple walk-offs he’s hit this season. Murphy’s offensive numbers have risen since the beginning of the year and he’s gotten better as the season’s gone on. However, unlike last year when Murphy was one of the only ones consistently producing, this year some of Murphy’s numbers can get buried underneath the stuff that his teammates are doing. Murphy can sometimes get overshadowed by Harper or Zimmerman, but that doesn’t mean he and what he’s doing should get overlooked. He may not be the flashiest player in the league, but Nationals fans know his impact. MVP Bryce is back, people. Bryce isn’t dominating the league individually like he was in 2015, but rather contributing to the best offense in the National League. He has a batting average of .325 (3rd in the NL), 20 home runs (T-8th in the NL), 65 RBI (T-6th in the NL), 69 runs scored (3rd in the NL), a .431 OBP (1st in the NL), .590 slugging percentage (4th in the NL), 1.021 OPS (2nd in the NL), 99 hits (T-8th in the NL), 21 doubles, and 57 BB (T-4th in the NL). His numbers are approaching those of his MVP season, and this year his team is backing him up, too. 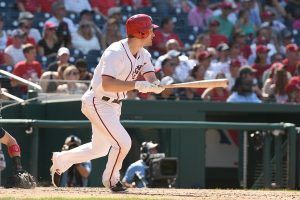 Instead of doing everything on his own, Harper is a cog in the offensive machine known as the Nationals lineup. And above all, Harper is absolutely clutch. Just this season, Harper has three walk-off hits. Throughout his career, he has eight. If he keeps it up, he may be able to reach or even break Ryan “Mr. Walkoff” Zimmerman’s numbers. 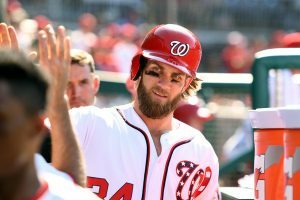 Bryce absolutely loves the high leverage situations, and that’s incredibly important for an MVP. It’s very possible that there could be repeat MVP this year. For the last few years, his name has always been brought up in the MVP conversation, yet he’s never managed to break through for the win. He finished second in 2013 and 2015 and came in eleventh place last season. The difference this year is that his team is actually good, and it might be enough to push him over the edge. In 2013 the Arizona Diamondbacks finished 81-81, in 2015 they finished 79-83, and in 2016 they finished 69-93. Their record at the All Star Break in 2017 is 53-35. And though your team’s record technically isn’t supposed to matter when considering MVP, people do take it into consideration. America’s First Baseman isn’t the flashiest guy in the league, and he tends to get looked over. But when you take a look at his numbers, he ranks in the tops in the league in almost every offensive category. He has a batting average of .312 (T-9th in the NL), 20 home runs (T-8th in the NL), 67 RBI (T-4th in the NL), 73 runs scored (1st in the NL), a .428 OBP (2nd in the NL), a .577 slugging percentage (6th in the NL), a 1.005 OPS (3rd in the NL), 99 hits (T-8th in the NL), 20 doubles, and 57 BB (T-4th in the NL). Additionally, he has a WAR of 4.0, the highest of anyone on this list and 5th in all of baseball. Goldschmidt is the heart and soul of the Diamondbacks, and the success of he’s leading his team to could help lead him to an MVP nod. Ryan Zimmerman came out of the gates this season with his hair on fire. At one point, Zim led in all three triple crown categories by a wide margin and took home the April NL Player of the Month Award. 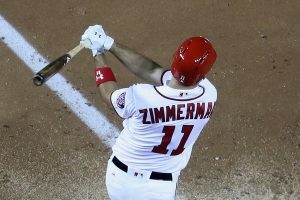 Zimmerman has made an incredible comeback from last season, and even though his numbers have cooled since the beginning of the year, he is still putting up MVP-caliber numbers. 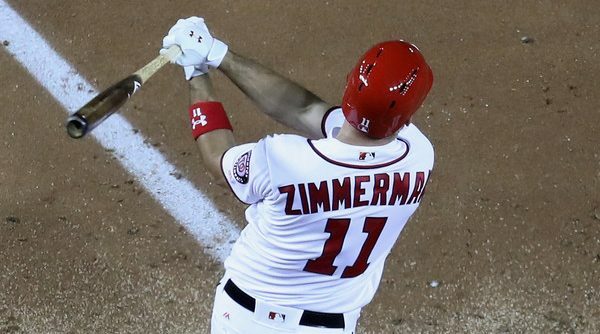 Zimmerman has a .330 average (2nd in the NL), 19 home runs, 63 RBI, a .373 OBP, .596 slugging percentage (3rd in the NL), a .969 OPS (4th in the NL), 98 hits, and 22 doubles (T-6th in the NL). And Zim has resumed his clutch status. Last year, Zimmerman would have people walked to get to him. This year Zim drives in runs like a fiend. It’s an incredible story, driven by a narrative of launch angle and health. Currently it’s being rewarded with an All Star start, and if he keeps it up, maybe it will end in some MVP consideration. It’s hard to leave out Joey Votto, the National League leader in home runs, slugging, and OPS (who also ranks in the top ten in average, RBI, runs scored, and OBP). But Cincinnati currently resides in the basement of the National League Central, and for me to seriously consider Joey Votto a contender, I’d prefer for the Reds to climb to at least third in the Central so the argument can be reasonably made that Votto is having an impact on his team’s success. And I only leave out Scherzer and Kershaw, the two best pitchers in the National League, because I don’t like to consider pitchers for the MVP award. A starting pitcher can be absolutely dominant on every fifth day, but they’re only out there every fifth day. That’s what the Cy Young is for. But if I did put them into the conversation, they would absolutely be up at the top of the list. 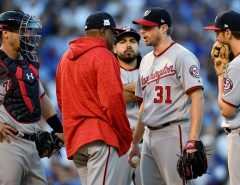 Scherzer leads the National League in ERA (2.10), strikeouts (173), WHIP (0.78), and BAA (.163). And whatever Scherzer doesn’t lead, Kershaw does (14 wins, most innings pitched). And they are one and two in every single pitching category. The two are absolutely nasty. One of the greatest pitchers of all time and the greatest pitcher right now. If they weren’t pitchers, they’d be a shoo-in on my list for MVP candidates. Among pitchers, Kershaw ranks tied for 3rd in WAR in the MLB (3.7), and Scherzer ranks 2nd (4.4). As you can see, the Nationals are well-represented in MVP consideration. While this could end up hurting them by splitting a potential vote, this means good things for the team. This is a team with three potential MVP candidates, the best pitcher in the game right now, and an All Star snub with the 6th-best ERA (2.86). Things are looking up for a star-studded Nationals team.